Lightweight and portable, Feather Flags are ideal for fetes, fairs and county shows, for sporting events on sand or snow, for clubs and special interest groups and advertising in almost any situation. They can be put up in a couple of minutes creating impressive advertising with, or without, any wind. Unlike traditional corporate flags our colourful Feather Flags can be seen, fully open, at all times even in still conditions. 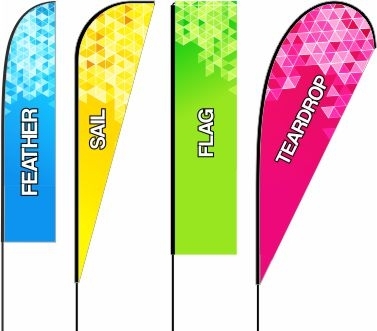 Feather Flags can also be called Sail Banners, they are both made in the same way with the same materials. 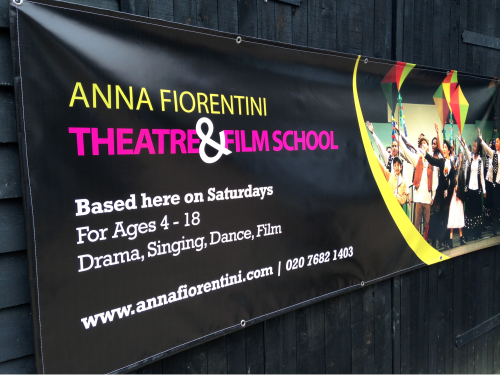 We can shape the bottom corner so as to create a stylish look but mostly we use the area to enable web addresses or phone numbers to be written across the bottom of the Sail Banners or Feather Flags. Dye Sublimation: Dye Sublimation is the process of fixing water based ink right into the fibres of the cloth using heat. Any other method isn't acceptable and won't give you a strong coloured washable product. Ask for a sample today! Fabric: After printing fabric since 1999 we know our fabric inside out. We choose a slightly denser 165gsm polyester to achieve the best colour on the front and enough show through to the rear. We feel 110gsm isn't enough and can look a bit "wishy washy". Reinforced Tip: As well as using a strong 250gsm pole sleeve we like to ensure the tip of the pole will never make its way out the top after prolonged use. This is why we add an extra piece of 520gsm PVC around the tip just to make sure! Pole Sleeve: A dedicated 250gsm fabric (slightly elasticated) pole sleeve tapered especially for the job. Available in Black or White these add strength and do away with messy pleats around the top curve of the feather banner/flag. Flag Poles:We have flag poles for all budgets and occasions. The most popular? Well that has to be our super strong sectional poles which come in their own bag. For occasional use why not try the telescopic fiberglass pole. 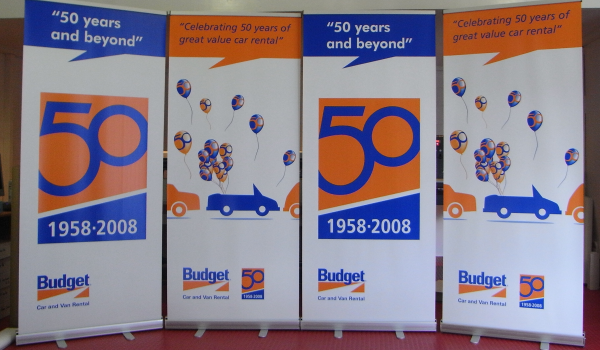 Freestanding Bases: Suitable for both hard and soft ground our freestanding banner/fag bases are the most versatile option when it comes to displaying your message. Usually the heavier the base the bigger the flag can be. Ground Stakes: Hammer or screw the choice is down to you. These ground stakes are perfect for soft ground including grassy fields and sandy beaches. There is nothing more simple than our hardened 12mm ground stake! 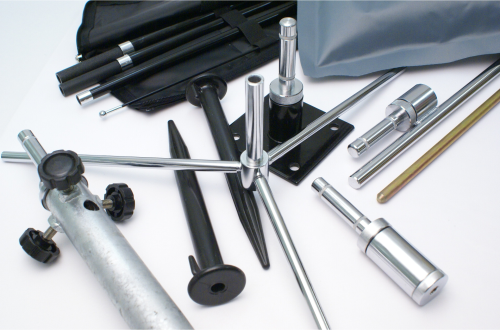 Fixed Bases: A wide range of special mountable bases for fixing to the ground, posts, marquees and more. 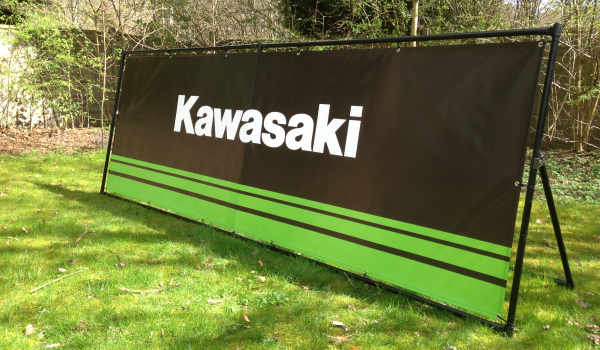 Designed with our smooth bearing spindle to guarantee flag/banner rotation and your message is visible. Feather Flags like the wind but if it gets too strong it's best to take them down. It's difficult to give a precise wind speed but anything over 25mph is deemed too windy. This is probably the most important part of keeping your flag displayed. If you fix the pole and stop rotation the flag will curl around the pole. It could even cause the pole to break! It's very unlikely that you will need to display your Feather Banner/Flag 24/7 so to prolong the life of it make sure you bring it in at the end of the day. You'll be amazed how much longer it will last. 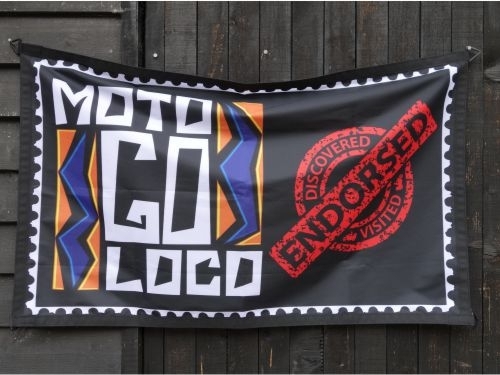 You might have your Banner/Flag close to a wall or the side of a car (using a car wheel base) and if allowed to flap against another surface this could lead to wear and subsequent ripping.